My husband and I have a list of 30 things to do before we are 30. One of them is to cook the entirety of a cookbook. This sounded like one of the easier ideas at the time but it is actually quite a challenge! We spent a while looking for a book which had few recipes involving mushrooms and grapefruit (neither of us like these!) and had a do-able number and complexity of recipes. You see I like a challenge but the difficulty involved in obtaining razor clams or in boning a pheasant goes a bit far. In the end we passed over Gordon Ramsey’s Just Desserts (because of what this might do to our waistlines- and a heart attack before 30 is not on the list!) in favour of a Moroccan cookbook. A do-able number of recipes and only a few exotic ingredients which can be web sourced (Ras el Hanout over the internet I can cope with, razor clams over the internet, not so much). So, this brings me to the ice cream. I’m trying to stick to the recipes, but I can’t always help myself. In this case it stemmed from not being able to get the ingredients from the supermarket, and no time for internet ordering. 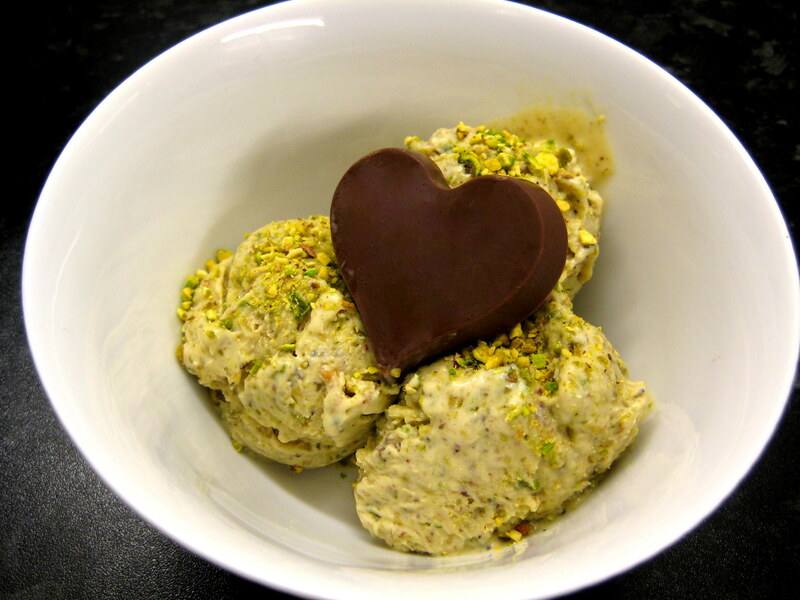 I substituted finely chopped pistachios for ground and some orange extract for rosewater. It was Valentine’s Day, so I also added some chocolate hearts. 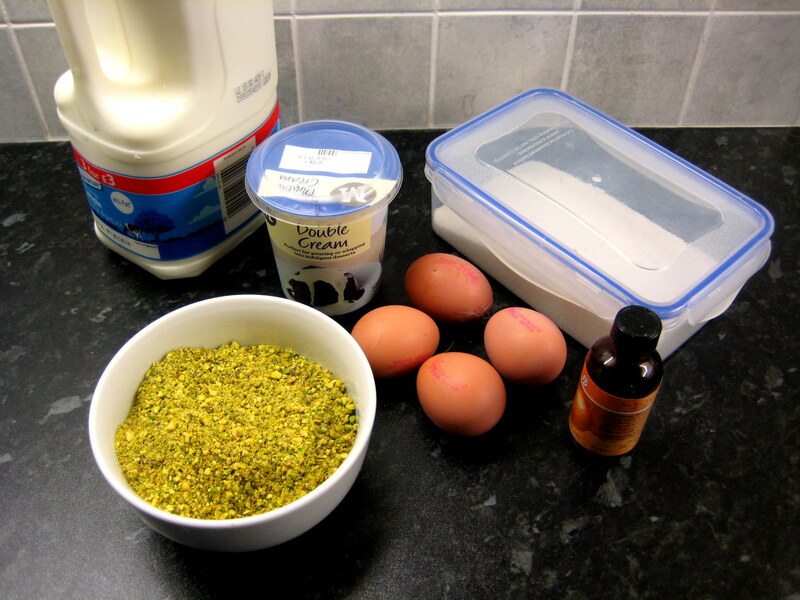 Put the milk, cream, and pistachios into a large pan and bring to the boil. Meanwhile, whisk the egg yolks and sugar together in a large bowl. Stir the milk mixture into the egg mixture, beating well as you go so the eggs don’t scramble. Return to the pan and heat until the custard thickens. Allow to cool before pouring into a freezable container (or put into an ice cream maker at this point if you have one). Freeze for 1 hour, then stir to break up the crystals. Freeze again for another 30mins to an hour and stir again. Return to the freezer. Remove from the freezer a few minutes before serving. I used 90g milk chocolate which was flavoured with orange and cardamom, which I thought went really well. Use plain milk chocolate if you prefer. 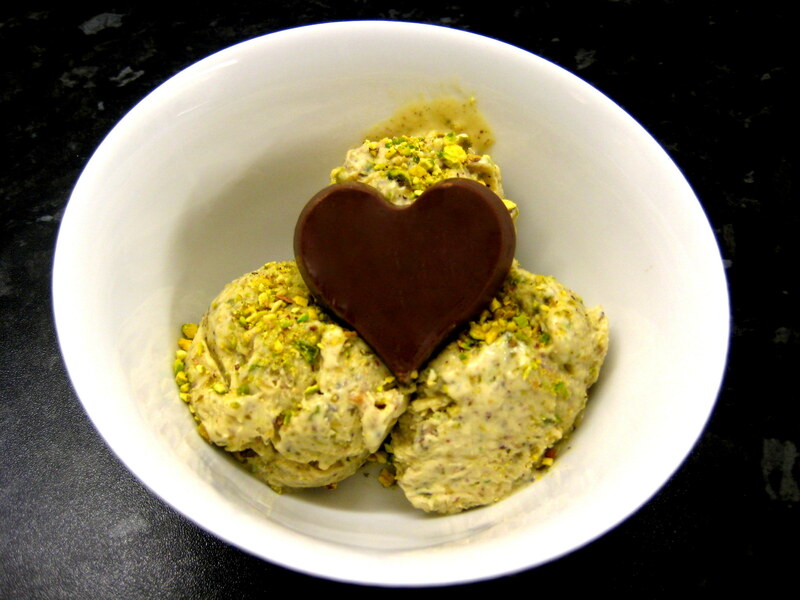 I melted it slowly over a bowl of boiled water (cheats tempering) and poured into heart shaped moulds – I used my heart shaped silicon muffin tray and made 5 hearts altogether. Looks good, smells good, tastes good! To serve I added some of the finely chopped pistachios which I saved at the start. Yummy!